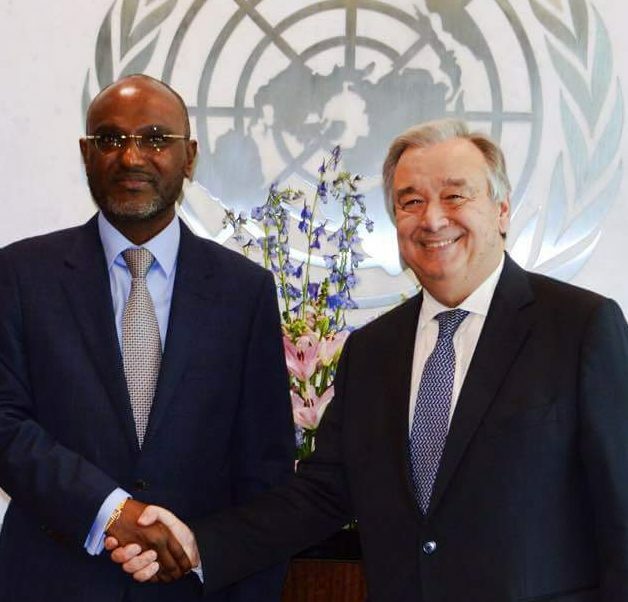 The new Permanent Representative of Uganda to the United Nations, Adonia Ayebare, presented his credentials to UN Secretary-General António Guterres today. Prior to his latest appointment, Mr. Ayebare was the Senior Adviser on Peace and Security at the African Union’s Permanent Observer Mission to the United Nations in New York from 2013 until 2017. Mr. Ayebare had previously been Deputy Permanent Representative and Chargé d’affaires in New York from 2010 to 2012, and from 2005 to 2008. Between those postings, he served as Director of the Africa Program at the International Peace Institute in New York between 2009 and 2011. From 2001 to 2008, he was Uganda’s Principal Adviser and Special Envoy to the Burundi peace process, having served as Ambassador and Head of Mission to Rwanda and Burundi from 2002 to 2005. As a journalist, Mr. Ayebare was a staff reporter with The East African weekly newspaper, based in Kampala, Uganda, from 1996 to 1998. Between 1998 and 2000, he was an information officer with the Integrated Regional Information Network. Holding two doctorates, from Indiana University and Rutgers University in the United States, Mr. Ayebare also has two master’s degrees, from Long Island University and Tufts University’s Fletcher School of Law and Diplomacy, also in the United States. Additionally, he earned a certificate in international security from Harvard University’s Kennedy School of Government, and Bachelor of Arts in Mass Communications from Makerere University, Kampala, in 1993. Born on 18 October 1966, Mr. Ayebare is married and has five children. Source — United Nations Press Office.